In March of 2018 we traded our 27FB Airstream and purchased a 2018 30RB. 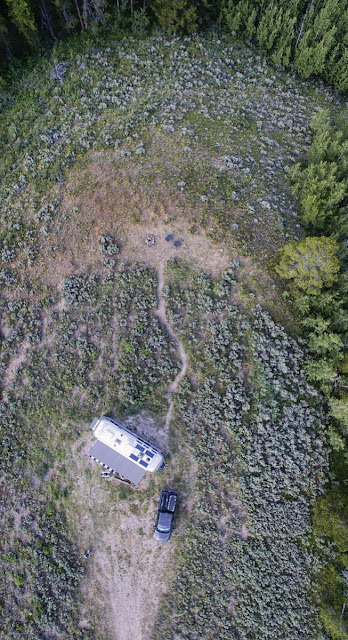 We really liked our ‘home’ and the modifications we had made, including the 400 watts of solar installed on the roof, but we absolutely fell in love with the 30’ layout and the extra space it provided. 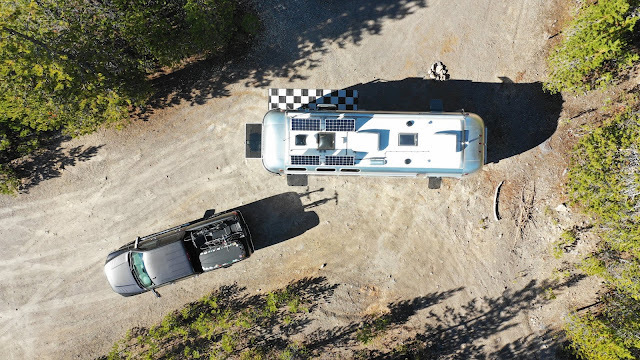 Part of the discussion before buying the new trailer was our solar... We knew we would want to duplicate the previous solar install on our new home as we found the 400 watts to be perfect for our usage and loved the lithium battery and the storage capacity it offered. Our solar install was completely trouble free and it functioned on a daily basis without any input from us. In other words, it just did its thing while we enjoyed the power it generated! 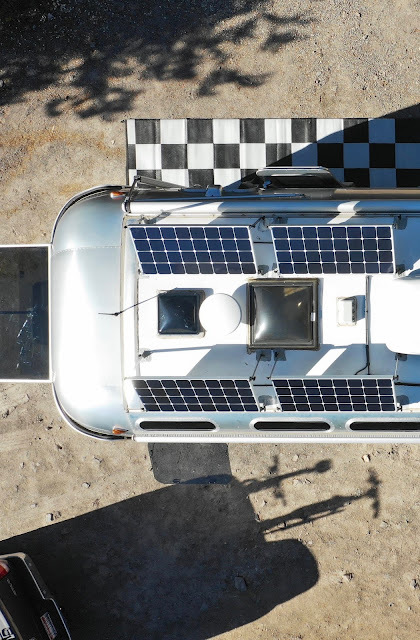 The lithium battery is maintenance free and the panels are permanently mounted to the roof of the Airstream, with tilt bars to capture the sun when it is a little bit lower in the sky. I had cleaned the panels a few times but we were amazed at how much of the sun’s energy they collected even when dirty. We contacted Lew Farber of Solar Tech Energy Systems again to plan our new solar install. This time around we were very familiar with the lingo and products so planning the new system with Lew was quick and easy. Because we were basically duplicating our previous system all we really needed to do was decide where to install the battery and inverter in the new layout. The two most practical locations in the 30RB are under the bed or under the couch. We had installed the battery, inverter and charge controller under the bed, in the middle section, in the previous trailer but with the ‘L’ shaped couch in the 30RB we had another option. The area under the bed is great for storage and we had hated losing that prime space! The existing 1000 watt inverter installed by Airstream sits in the corner under the ‘L’ part of the couch in the 30' so by placing the new inverter in that location and the battery next to it we didn’t take up much more storage space than was already taken. It still left us with the entire storage area under the main section of the couch and all the premium under-bed storage. We dropped the trailer off in Bingen, WA with Lew the first week of June and left it in his care for the next 10 days. He installed the same 400 watts of panels on the roof, the 50 amp solar controller and the same 2000 watt inverter, all from AM Solar as he did previously. AM Solar is now offering a LiFeBlue lithium battery which has the battery monitoring system pre-installed/pre-wired whereas our previous battery was a Victron with an external battery monitoring sytem. The internal wiring means that the installation of the new LiFeBlue battery is simpler and therefore, a little less costly. Lew also installed another weBoost cell booster with enhanced antennas. As we were able to do previously, having the 300 ah Lithium battery and the soft start allows us to run the air conditioner for 1 to 2 hours on the battery bank without being plugged in to shore power or a generator. All the wiring is run down through the refrigerator vent so no penetrations were made in the roof, including the weBoost wiring. The panels and weBoost antenna are mounted with double stick tape and Dicor sealant, also assuring that no mounting holes were made in the roof. I won’t go into any more detail about the equipment and the specifications, but if you are interested, AM Solar (www.amsolar.com) has a great web site and discusses equipment options, specifications and advantages and disadvantages of each component. The also sell DIY solar kits for those that are interested in doing the install themselves. After we picked up the trailer and did our own on the road testing, (aka, living in the trailer!) we had an issue with the new inverter which Lew trouble-shot over the phone with us and had it replaced at no cost to us. We also had a minor wiring issue this time around so while we were in Oregon this fall we had AM Solar take a look at it and with their help we’ve had a trouble free system. Both Lew and AM Solar have been great to work with and are really knowledgeable! The benefit of having solar means that we can boondock or dry camp at anytime without the need for electrical hookups or the noise and inconvenience of a generator. We like to follow the weather, and the sunshine, so it gives us lots of options in our travels! If you have any questions or would like additional information, shoot us an email at 4000rivets@gmail.com or come meet up with us out in the desert sunshine this winter!